Thai food has long held a special place in my professed obsession with searching for ultimate culinary bliss. It is definitely my ‘go to’ ethnic food. 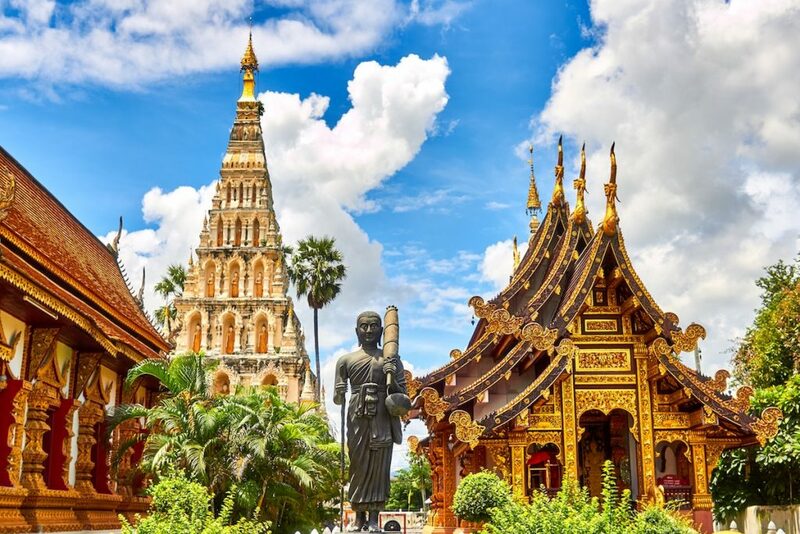 Who hasn’t felt the urge to make the phone call to your local Thai restaurant and order the quintessential Pad Thai, Tom Ka Gai or Chicken Satay. But in Thailand, nothing screams “tourist” louder than ordering those imported versions of Thai comfort food. It’s not that you shouldn’t order them but with hundreds of other exotic options, the question becomes, why? I’ll be the first to say exotic might be a little too overstated but simply saying different doesn’t do the essential ingredients justice. Let’s just say, it’s complicated. 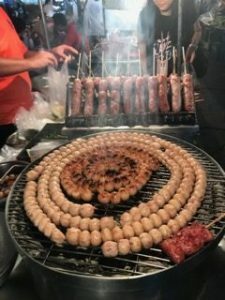 Chiang Mai in the north of Thailand is the perfect destination for a feeding frenzy of intrepid dining. Experiential travel is one thing but experiential grazing on foreign street food demands some degree of guidance. Choosing to experience a foodie’s night out with the organization, A Chef’s Tour was a master stroke in decision making. 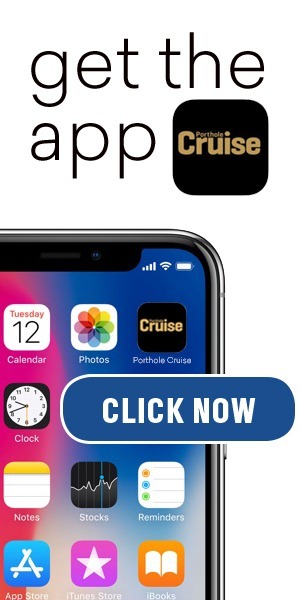 RELATED: What Are They Sniffing in Thailand? The evening starts early in order to avoid any chance of the legendary street food vendors being sold out. It’s not uncommon to find lines forming as early as 6 pm at the more popular hawker stands. Few locals actually eat at home and every bit of sidewalk space throughout the city is claimed by entrepreneurial cooks catering to the city’s hungry legions. The first stop is at The Cowboy Hat Lady’s stand, a local legend documented in several TV travel and food specials. 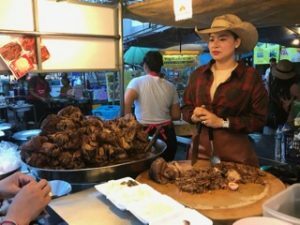 Her specialty is Khao Kha Moo, a braised pig knuckle resembling pulled pork, marinaded in her highly guarded recipe of spices and served over rice with a side of pickled greens and chili sauce. This little free standing, street side kiosk serves up to 320 knuckles a day. Dividing that by four, simple math will tell you how many piggies went to market reluctantly donating their limbs to the cause (assuming that a pig has four knuckles). Next stop, a fresh food market, the ultimate tasting plate of knowledge. Starting in the vegetable section Moui explains the applications, advantages and origins of anything and everything green. Who knew that there are four different types of basil or that the appropriately named stinky fern could be used in omelettes. Nibbling our way through the garden department, we take on the challenge of tackling the market’s spice segment. 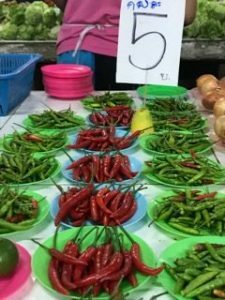 Chilis of all kinds reign supreme but multiply the types of spices you can nam by ten and you will understand the complexity of Thai cuisine. Navigating through the bustle of the market over to the pungent counters of fish, curry and shrimp pastes, there is no place for timid hesitancy. The one word that keeps coming up is fermented. It is strange how using that term in wine production is revered, yet when you hear fermented fish, soybean or eggs the lips tend to be clenched. Nevertheless, we are here to try foods, after which I attest to the previously mentioned, it’s complicated. After a fabulous sampling of sweets, desserts and fruits we move on to a “hot” night cafe specializing in Laab Moo, a spicy minced pork dish served with sticky rice. Grab a pinch of the sticky rice, press down on the pork and the attached meat forms a perfect bite sized bomb of heat. With eyes watering and visible steam coming out the ears, Moui pulls out an assortment of sides she acquired at the market; a spiced up sausage, some grilled pig brain wrapped in banana leaf, (pretty good BTW) and some steamed water buffalo. Next up, salads at an ethnic Burmese restaurant. Fermented tea leaf salad, turmeric salad and penny wort salad. Any sense of hunger has long been satisfied but the night is still young and it’s off to Chinatown for soup. Cauldrons of steaming soups provide the next course. Chicken curry, chicken blood soup, vegetable soup and another whose Thai name escapes me as it is now entering our fifth hour of non stop eating. I’m fully aware that I may have overstated the weirdness factor for dramatic journalistic effect but suffice it to say that this was one of the most educational, fascinating food adventures I have ever been on and I’ve already booked my next A Chef’s Tour adventure for New Delhi in March. Stay tuned for their take on Indian food.